Premium luxury watches are found insanely pricy but we understand that the brand value, life-time warranty, best technology, and obviously the designer look of these watches are all attributable to the high pricing. However, perhaps there is one luxury watch brand that offers its watches at realistic prices despite its premium quality components, performance, and opulent look: the brand is named as Hautlence. Hautlence is one of the best luxury Swiss watch brands. Its manufacturing unit is based at the silver valley of watch making, Neuchâtel, known as the Mecca of luxury watch production. The founders of this premium watch manufacturing company are five talented entrepreneurs; they are Guillaume Tetu, Renaud de Retz, Jean Plazenet, Alain de Forges, and Jean- Christophe Chopin. From 2004 to 2012, all five partners ran the show of timepiece making successfully, and in 2012, the Hautlence company was acquired by Georges-Henri Meylan. Henceforth, the Meylan family is running the business lucratively. In 2013, the company’s headquarters moved to La Chaux-de-Fonds. Each Hautlence watch is built with three distinct features; the first one is innovative design, next is functionality, and the third one is impeccable architecture. The first watch introduced by Hautlence was powered by a Swiss watch movement based on a manual winding process, which is technologically deciphered by Peseux7001. Strict quality assurance and excellent innovation is the distinct facade of this brand. The limited editions of Hautlence are manufactured maximum with 88 pieces for premium customers. 2014 was a special year for this brand. During September 2014, the brand celebrated its 10th Birthday. This year, Hautlence launched their most treasured watch collection destination and it was a big hit. The Hautlence HL 04 premium luxury watch was one of the best watches the brand has produced so far for its consumers. It took 4 years to develop the model. It was displayed once in 2010 and finally it was released in 2011. Only 88 pieces were produced as a limited-version watch. The watch case was made of white gold and it comes with a premium-quality leather strap. Hautlence applied an automatic movement to run the watch and its special features. 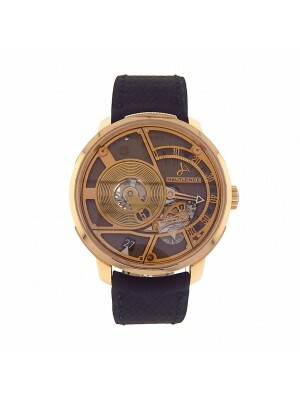 Besides new ones, Hautlence HL 04 used luxury watches enjoy great demand worldwide too. Hautlence Destination 03 is a manly-looking watch built with bold lines, zed-black color, as well as a sturdy robust look. It runs on an automatic movement and the neatly finished grey colored watch case is built with best-quality titanium. The black strap added to the watch is procured from best-quality leather. The face of the watch shows day/night, hours, and minutes; it also offers the setting of double time indication on one dial. Hautlence HL-04 luxury watch is meant for men and best-quality white gold is used for making the watch case. The watch comes with grey-colored face covered with scratch-proof crystal sapphire, fixed bezel, and an alligator leather-made watch strap. The watch runs on a Swiss mechanical movement; it is initially water-resistant up to 100 meters/30 feet. Hautlence is a premium luxury watch brand: its quality, features, and functionality are the reasons used Hautlence watches are also in great demand. If you are looking for a genuine Hautlence used watch to buy, check the stock of Midtown Watch today to grab some of the sizzling hot deals!